Siempreverde has been dedicated to Landscape design for more than 40 years. 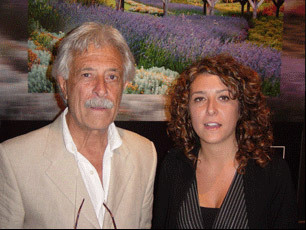 The Directors of the study are the landscaper Roberto Mulieri and his daughter, Lic. Maria Mulieri. The study’s professional history is backed up by more than 2,600 works in the private and public sector. The Directors are invited to give seminars, courses and conferences both in the country and abroad. Some of Siempreverde’s works, where the centre of the interventions is basically commitment and respect for the environment, are exposed in the books Paisajes Esenciales and Paisajes Esenciales 2 (Essential Landscapes 1 & 2). Born in Buenos Aires, Argentina in 1943. Studied in “la Escuela Superior de Jardinería de la Facultad de Agronomía de la Universidad de Buenos Aires” (School of Gardening, University of Buenos Aires). Half of his life was dedicated to teaching and the other half to finding and places and creating spaces. Coordinated the first Landscape National Conferences in 1983 (Jornadas Nacionales sobre Paisaje). Member of the Argentinean Landscape Architects Centre. Lecturer at conferences and seminars on Landscape and Environment. Founding member and President of "Federación de Nodos de la Red Argentina del Paisaje (RAP)" ( Nodes Federation of the Argentinean Landscape Net). Coordinates the Landscape Observatory Governing Council in Exaltación de la Cruz (OP-Cruz). Co-coordinates the Landscape Political Management Node of the Latin American Landscape Initiative (LALI). Studied at UBA, University of Buenos Aires, Architecture, Design and Town Planning Faculty, Degree in landscape Planning and Design.